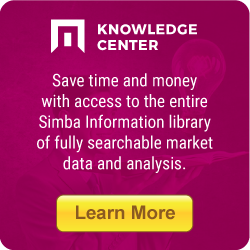 How does searching on SimbaInformation.com work? Start your search finds reports containing your keywords in the title, abstract, table of contents, or publisher name. You can also use Advanced Search tool to narrow your search by price, date published, topic, and geographic region. Registration gives you access to report descriptions, tables of contents, and the Search Inside Report feature. You can also receive complimentary search assistance from our research specialists. Simply request your password and it will be sent to the email address used as your username. You can also contact customer service at 888.297.4622 (U.S.) or +1.240.747.3091 (Int'l) for assistance with any of your account information. If your information changes, you can update it by going to the My Account section. (There’s a link to My Account at the top of every SimbaInformation.com page.) If you have questions about making account changes or wish to discontinue using our service, please call 800.297.4622 (U.S.) or +1.240.747.3091 (Int'l), email customerservice@simbainformation.com, or send a written request to Simba Information, 11200 Rockville Pike, Suite 504, Rockville, MD 20852. First choose a delivery option for your chosen report, such as online download. Then click on the Add to Cart button to begin processing your order. The Shopping Cart will hold this product and any other choices until you decide to Proceed to Checkout. You can access your Shopping Cart from the View Cart link in the top right corner of any page. You can modify your delivery options in the Shopping Cart by changing your delivery selection for the respective product. You can also change the report quantity. Once you’ve completed your choices, click on the Complete Order button. For online orders we accept Visa, American Express, MasterCard, and Diners Club. Arrangements for payment by check, wire transfer, or invoice can be made by contacting customer service at 800.297.4622 (U.S.) or +1.240.747.3091 (Int’l) or customerservice@simbainformation.com. Items purchased for online delivery are normally available as soon as your order is processed. If you place a hard copy order or purchase a publication before it has been published, you will be notified by email when the product is shipped. Hard copies require 3-5 business days for delivery. Note for first-time buyers: For your security, please note that you will be contacted within one business day to verify your information prior to delivery of your first purchase. If you make your first purchase over a weekend or holiday, you will be contacted the following business day. What are shipping and handling charges? There is a $5 handling charge for processing orders. All shipping and handling charges are listed for your review on the Order Checkout screen prior to confirming your order. A "cookie" is a passive piece of information stored on your computer's hard drive. It automatically informs Simba Information of site-specific information, such as your username and what information products you've bought from our site in the past. Setting your browser to accept cookies will streamline your use of SimbaInformation.com, so that you don’t have to log-in each time you visit our website.